Method: Add all ingredients (minus toppings) to blender and blitz till smooth. Pour into bowl of choice and get creative adding your toppings. Then Instagram. I literally have been drooling over acai bowls for months now. Most recipes call for frozen acai pulp which is costly and difficult to get your hands on over here in the UK so after some advice & tips I picked up a bag of acai powder and got creative to make my very own recipe. Acai is a berry which comes from Brazil and has been given the superfood label. It’s packed full of antioxidants – more so than blueberries – as well as vitamin E and essential fatty acids. An acai bowl is basically a smoothie that you eat in a bowl. You want it to be thick enough you can spoon it into your mouth and not too runny that you have no choice but to drink it. The aim was to make myself a delicious fruity breakfast which would keep me full. This recipe is packed with good fats from avocado, protein from the protein powder and I even managed to sneak a little bit of green in there. Once the smoothie part is done, you can get creative with your toppings. I opted not to go too crazy with extra fruit. I had a box of cherries from Tesco on hand; I got them via their Orchard programme where you get to try products for free every now and again. Apparently, picking cherries and berries is a bit of an art form! Cherries need very cold nights when in their dormancy period through the winter – so the British climate is surprisingly great for cherry production! Ready for breakfast again, or what?! What’s your favourite smoothie ingredient?! 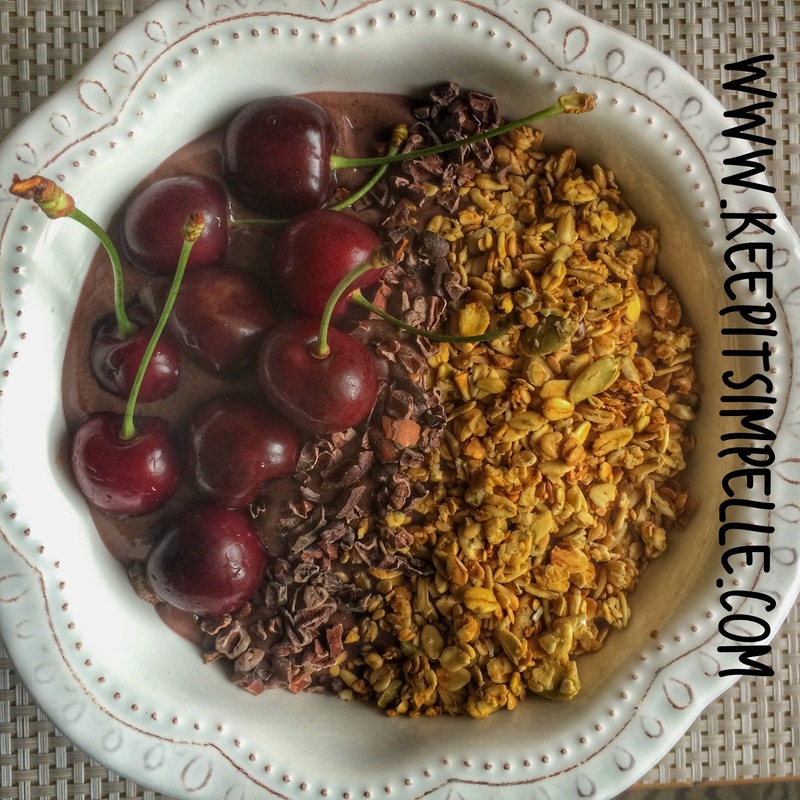 Got an acai bowl recipe to share with me?! I do love cacao nibs! when they have been baked (like on top of a cake or something) they are extra creamy and chocolatey!! Yum! That looks SUPER yummy… I'm going to make a smoothie bowl for lunch! Wow your acai bowl looks amazing!! Love the idea of a smoothie in bowl form haha. If acai wasn't so expensive, I would do dig making these! Thanks Alicia 🙂 it is indeed! let me know if you try or adapt it!! I'm always looking for inspiration!